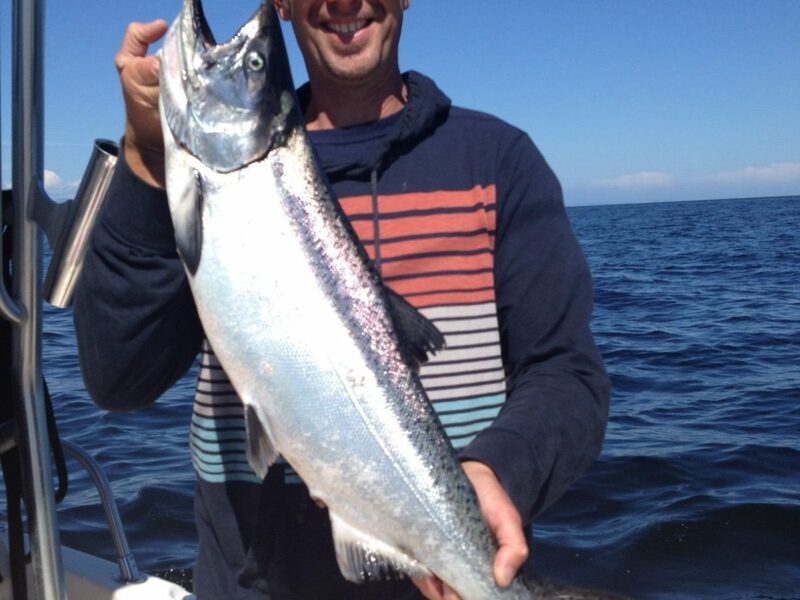 It is that time again to get your beach fishing tackle ready as the coho salmon will start accumulating in our estuary at the mouth of the Capilano River. The river is low and will probably stay like that as there is no rain in the forecast. Some coho have been caught already with gear, so as more fish start milling around the chance of catching them on the fly increases. The low tides are in our favour this week so take advantage of this if you can and get on the water. I have the beach flies in the store and if you like to have a better understanding of this intense fishery join me in our Fly Fishing on Beaches Course. 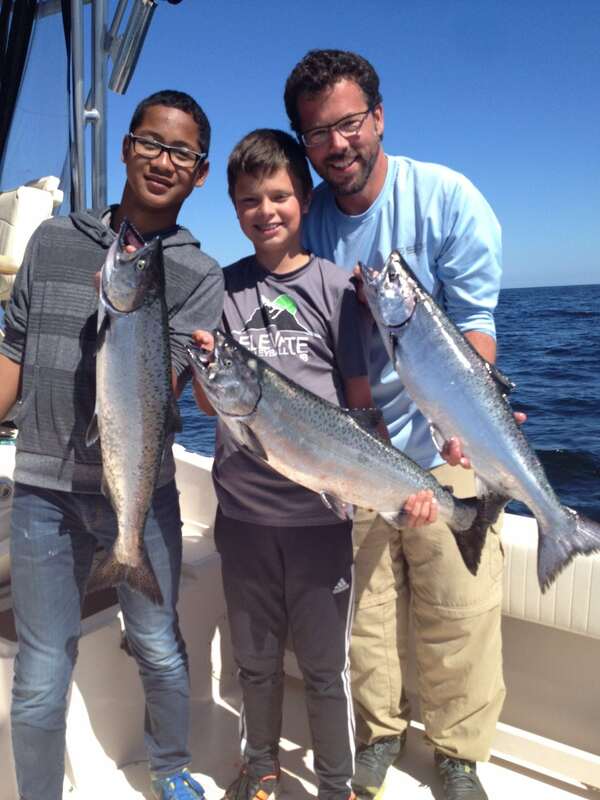 We are offering 3 dates again this summer so be sure to attend one evening as this calls will help increase your chances of catching these finicky coho. If you’re heading to the beach with a gear rod you want to have a variety of blue fox spinners and Gibbs crocks in different colours. For a rod and a reel an 8-9FT rod with a spinning reel is an ideal set up. 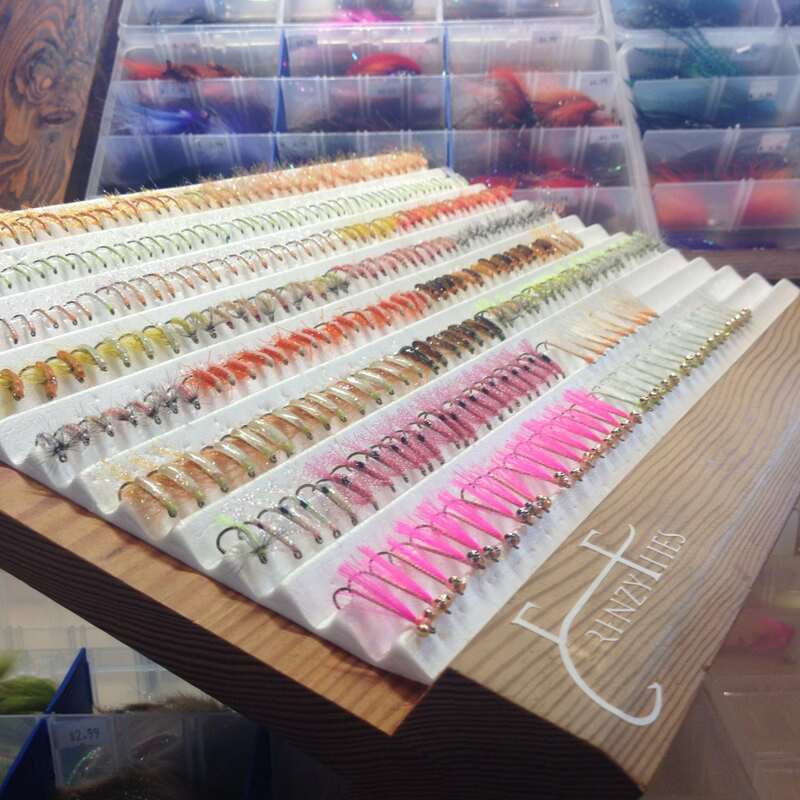 We’re fully stocked with Andre’s custom tied beach flies! Well it seems the fishing off Bowen has finally tapered off. It was an interesting 6 weeks with lots of anchovies and lots of chinook around and some good numbers of coho as well. You could see it tapering off this past week with some hot and cold fishing. There is still some bait around so it wouldn’t surprise me if there are some good reports here and there, but for the most part the slow days out numbered the active days lately. 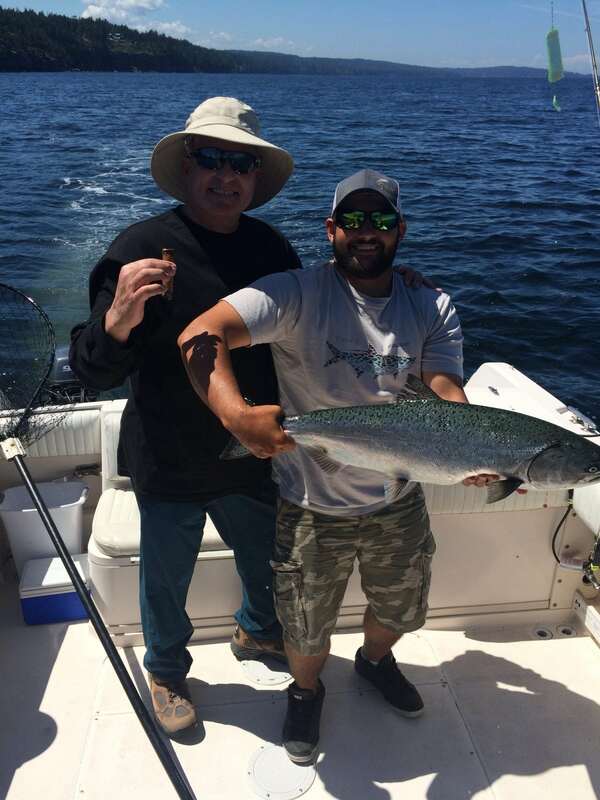 Coho fishing has officially kicked in with anglers now catching fish from Point Atkinson to the Pink Apartment, with good numbers of fish in the Capilano River as well. As mentioned in previous reports, the fish are shallow, from the surface down to around 40 feet. White hootchies with a 28 inch leader are very productive. For flashes the Purple Onion Glow, Green Onion Glow and Betsy are all good choices. Expect the coho fishing to pick up even more in the next 2 weeks. Eddie’s guests with some nice fish landed at Thrasher this week. Out of nowhere Thrasher really turned on this week with both Eddie and Dimitri having some excellent fishing. As per usual this time of year the fish are fairly deep, looking for bait on the structure. 180-220 feet on the downriggers is not uncommon and we highly recommend using 18 pound cannonballs so you can stay deep and troll fast to cover water. Glow is the name of the game, so a Pesca spoon in 3.5 or 4.0 is a great choice. Hot flashers are chartreuse glow and my favourite is the double glow. There really is no point using reflective tape when you are bouncing bottom in 170-220 feet of water. The glow flasher and double glow flasher really do make a difference. Another productive option is a glow hootchie with a 32 inch to 40 inch leader behind the glow flasher. I usually run a glow flasher, 6 foot leader, to a glow spoon on one rod and then a glow flasher and a 32 inch leader to a glow hootchie on the other rod. Don’t try stacking rods, keep it simple and with one rod on each rigger you can keep the gear down deeper. We will see how long this pod of fish at Thrasher lasts, it is likely just a flash in the pan because this fishery is usually winding down this time of year. This year has been much different than most, so we will see what happens. Dimitri helping his guests get warmed up for their trip to West Coast Fishing Club. If it is too windy to get to Thrasher or you don’t have the time, I would try West Van for coho or you could always head over to the Bell Buoy and you might get into some mature chinook looking for the Fraser. These fish are often shallow and the best depths on the downriggers are 30-70 and a glow flasher and an anchovy in a glow teaser head is one of the most productive setups.